Grevillea ‘Pink Surprise’ is a hybrid whose parents are said to be Grevillea whiteana and Grevillea banksii (red form). The original seedling was found in a garden in a Brisbane suburb. Grevillea ‘Pink Surprise’ is a tall shrub that has reached a height of four metres with spread exceeding two metres in our garden. The leaves have multiple, narrow lobes, shiny on the upper surface and up to 30 centimetres long. The large, eye-catching flower spikes are about 15 centimetres long, 5 centimetres wide, pink with long cream styles and attractive to honeyeaters. Blooms are carried for many months. Occasional light pruning is appreciated. 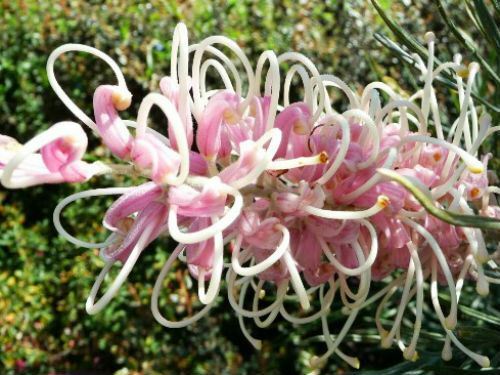 Grevillea ‘Pink Surprise’ is a beautiful shrub with spectacular flowers. This is one of severalf beautiful hybrid grevilleas whose parents are sub-tropical species. Both hybrids and parents would be frost sensitive and usually not considered for cultivation in frosty, cold climate gardens. We succeed with Grevillea ‘Pink Surprise’ and other sub-tropical hybrids and species by growing them close to the northern walls of buildings and surround them with our usual dense shrubberies. Warmth radiated from the buildings and shelter from other plants has allowed these beautiful plants to survive, thrive and bloom bounteously in our garden. Our Eastern Spinebills enjoy our Grevillea ‘Pink Surprise’ as much as we do.